A national flood support centre has been set up to respond to further outbreaks of severe weather. The Worcester centre's opening comes after fire chiefs said they struggled to cope with this week's floods. More wet weather is forecast for the weekend, and the Met Office has issued a severe weather warning for all of England and Wales. 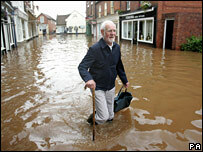 Meanwhile, Prince Charles has visited Catcliffe in Yorkshire to meet some of those most affected by the floods. 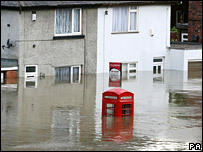 The village provided one of the most striking images of the last week - a public phone box almost entirely submerged by water. But the prince was able to walk along the village's main street in sunshine as residents came out to greet him. 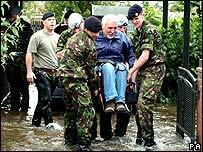 This week's floods have been most severe in Yorkshire, Lincolnshire and the Midlands, and have claimed the lives of at least four people. The Association of British Insurers (ABI) said 27,000 homes and 5,000 businesses had been affected and that clean-up costs could reach £1bn. "We are doing all we can to help families, elderly customers and those with health difficulties first," he said. The national flood support centre will gather information from emergency services around the country and feed the information back to a central office in Manchester, which will coordinate the deployment of any extra resources. "Because we haven't got standardisation of our equipment and our training it does mean we aren't as effective as we otherwise could be." he told the BBC. Fire unions said members had been working to the point of collapse after dealing with the floods virtually non-stop for three days. It has described the rescue effort as the "biggest in peacetime Britain". A slow-moving area of low pressure will bring more persistent and heavy rain over the weekend, says the Met Office. Rainfall of 15-25mm (0.6-1in) is expected quite widely across England and Wales but there could be up to 50mm (2in) in some places. The wettest conditions are expected on Saturday across western England and Wales. BBC weather forecaster Jay Wynne said: "It's overnight and into tomorrow [Saturday] when we're looking at more rain. On Sunday we're looking at heavy showers which could bring quite a bit of heavy rain with them. "Some places could see heavy shower after heavy shower but thankfully they should move through pretty quickly. "The real reason for the early warning is that rivers are already swollen and any extra rain won't help the situation." New Environment Secretary Hilary Benn and Cabinet Office Minister Ed Miliband visited Yorkshire on Thursday. Mr Benn said people without insurance who had been affected would receive help from the government. He said: "People are angry and distressed about what's happened and I sympathise with those who feel this way." Power has been restored to the final 100 customers in Yorkshire whose supply was affected by flooding, and whose properties are safe to carry electricity. More than 350 people were evacuated from their homes in north Doncaster after the River Don burst its banks.